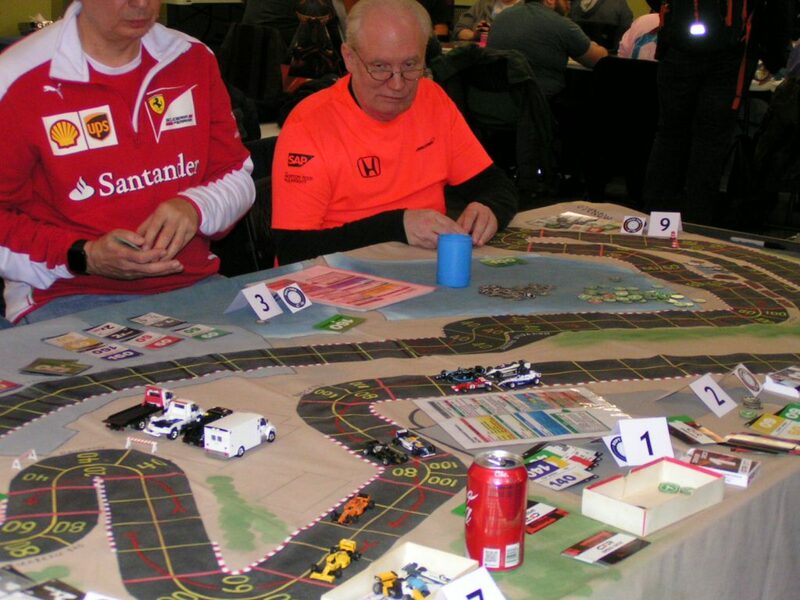 Eight drivers raced in the Monaco Grand Prix on Friday, November 10, 2017, at Imperium Games in Wixom, Michigan, using the board game rules for Championship Formula Racing (CFR). When the race was over, Mike Cook won the race, after he started in pole position. Gary Sturgeon finished 2nd, and Garry Kaluzny managed to hold onto 3rd place from Greg Lim. 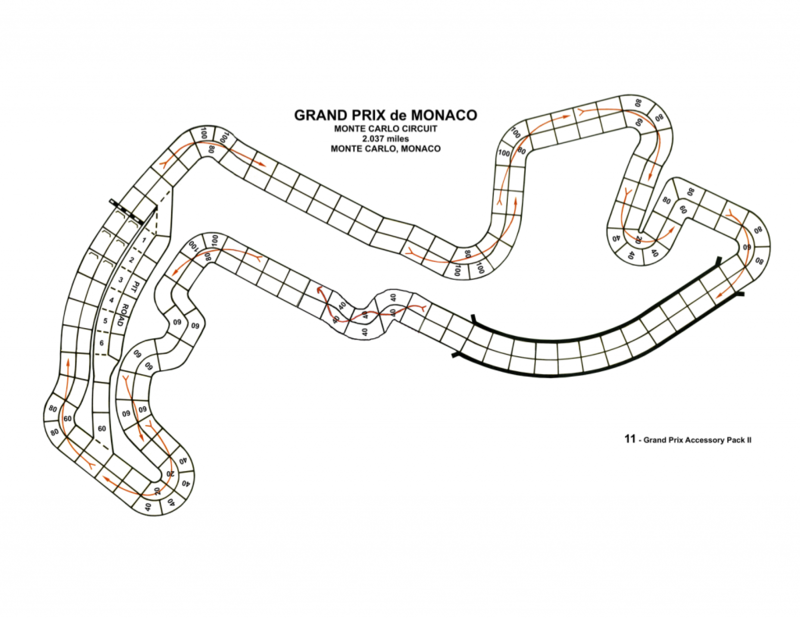 The real track diagram of the Monte Carlo track. 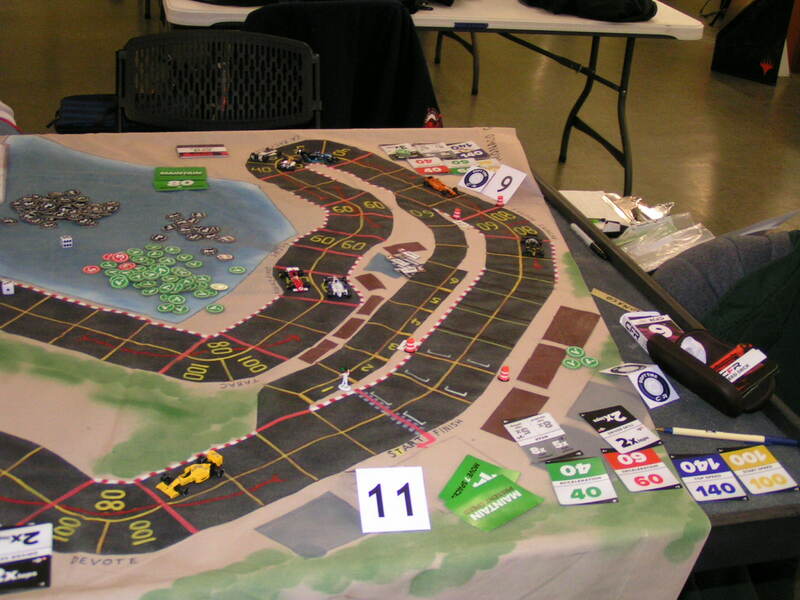 Although the new CFR game comes with a game track of the Monte Carlo course, it is not accurate at all, so we used (as a basis) the version of that track that was published with one of the old Avalon Hill Accessory Pack tracks, although we modified the Avalon Hill track by adding the nouvelle chicane. The Monte Carlo track we used to race on. 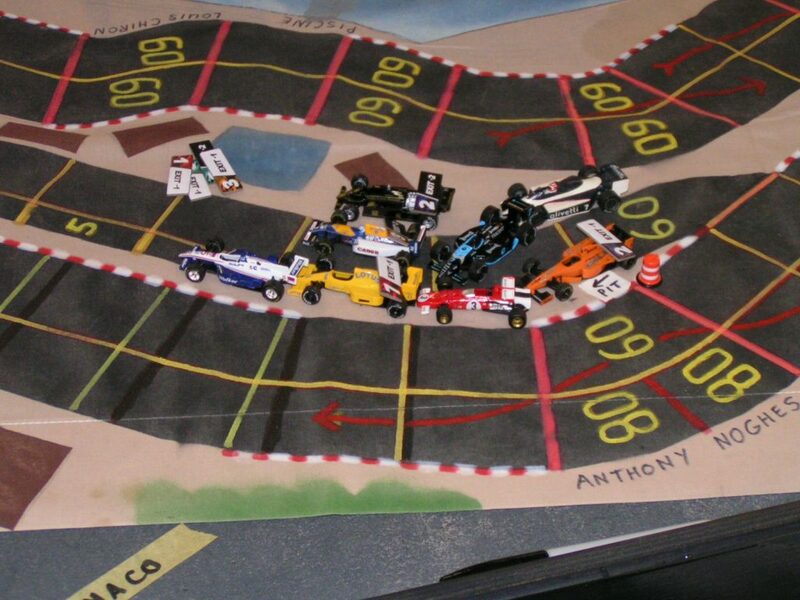 The starting grid for the Monaco Grand Prix. Mike Cook is on the pole (yellow car); Jack Beckman is next to him (red car). 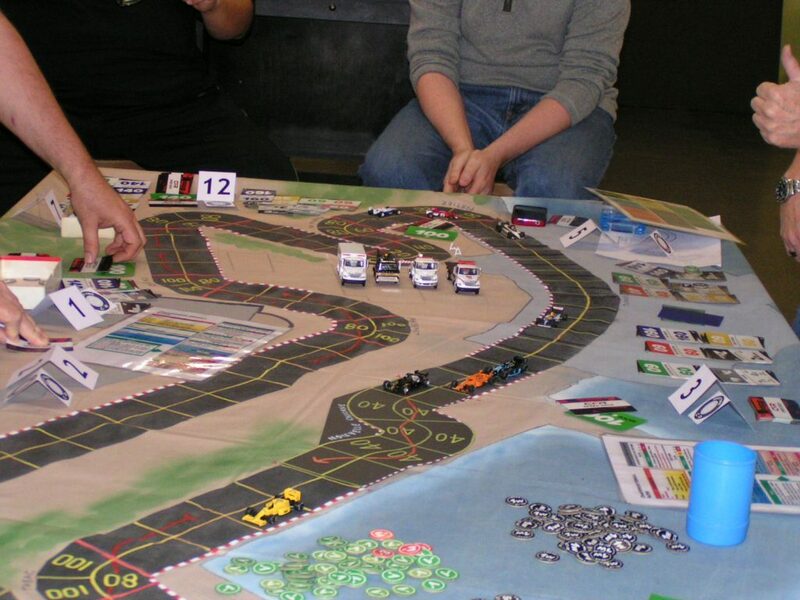 2nd row is Garry Sturgeon (black car) and Jim Robinson (white/blue/yellow car). Brian Robinson is the 3rd row, Garry Kaluzny is the 4th row, Greg Lim is the 5th row, and Richard White is the 6th row. From the start, Mike Cook zoomed into the lead with his 100 mph start speed, followed closely by Jack Beckman’s Ferrari after Jack rolled dice to boost his start speed to 80 mph. Jim Robinson held 3rd, Brian Robinson pulled alongside Gary Sturgeon, then Garry Kaluzny had to slow down to 60 mph after boosting his start speed to 80 mph. Kaluzny rolled an unmodified start speed roll instead of using a wear (since he was on soft tires at the start, Kaluzny could have used a wear to boost his start speed), but rolled that unmodified start speed roll in hopes that he wouldn’t get the increased start speed. But, Kaluzny did get the increased start speed, then had to spend a wear to slow to 60 mph. Richard White passed Greg Lim at the start, due to Lim starting at only 20 mph, plus White boosted his start speed to 80 mph. After the first move of the game, Cook and Beckman jump into the lead. After everyone got through the first corner at Ste. Devote, Jim Robinson passed Beckman for 2nd place going into the Massenet corner. Kaluzny also passed Brian Robinson for 5th place. 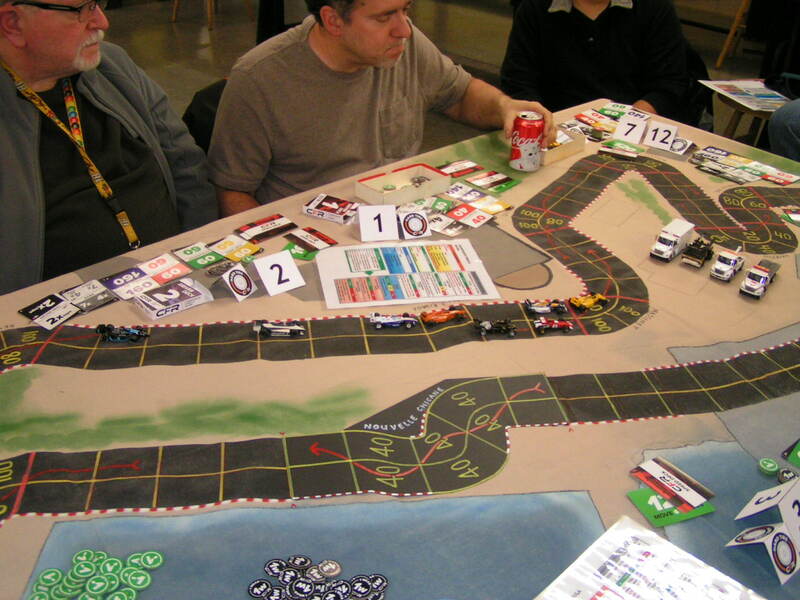 Heading into Massenet for the 1st time, Jim Robinson passes Beckman’s Ferrari to take 2nd place. Jim Robinson and Richard White look at the action on the track. Then, heading into the sharp right-hand Mirabeau Haute corner, Sturgeon passed Beckman and took over 3rd place. 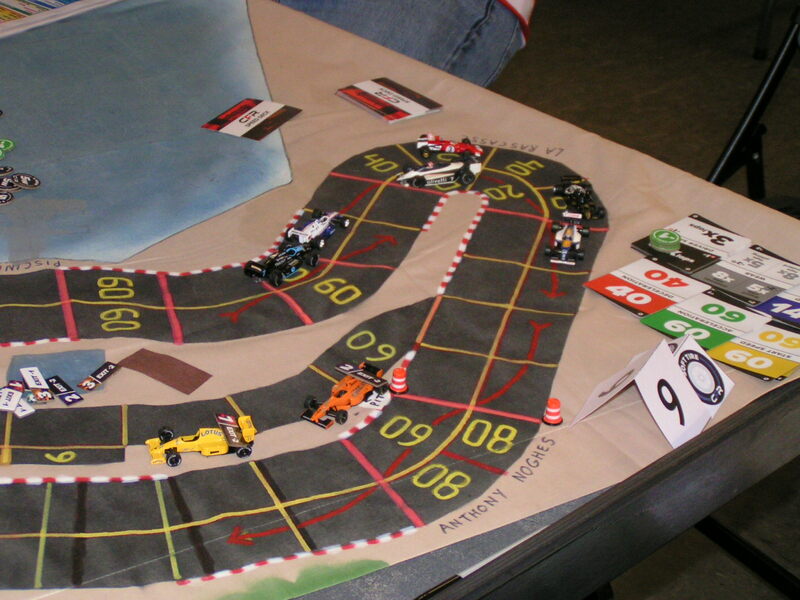 Then Beckman fought back and passed both Sturgeon and J. Robinson to reclaim 2nd place going into the “Hairpin” (I still call it the Loews Hairpin, even though it has had many names over the years). Into the “Hairpin” for the 1st time, Beckman reclaims 2nd place. But then again, J. Robinson, Sturgeon, Kaluzny, and White all passed Beckman by the time the pack got through the Portier corner which led into the tunnel straightaway. J. Robinson pulled along Cook just before the Nouvelle Chicane, but then had to back off. Then Kaluzny made a pass of J. Robinson coming out of that chicane, and pulled alongside Cook as they were headed into the Tabac corner. Through the Nouvelle Chicane for the first time. 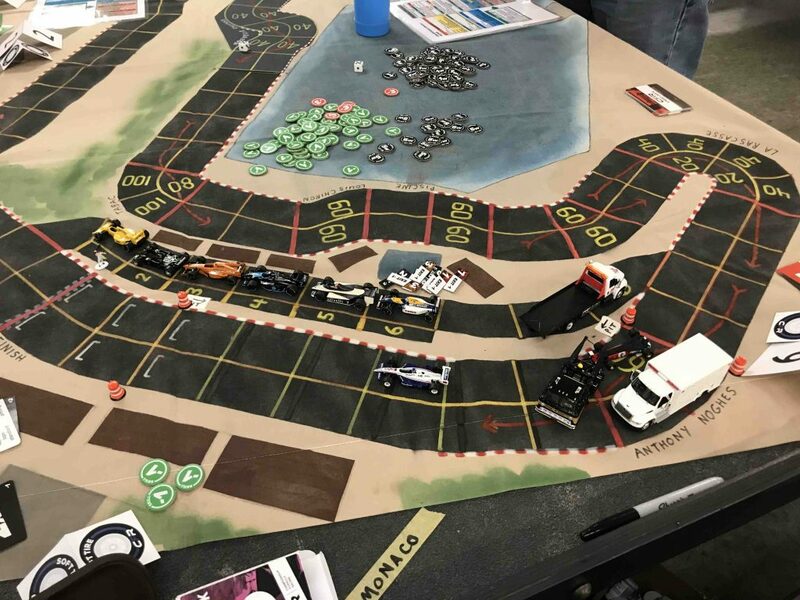 Kaluzny (orange car) is alongside Cook (yellow car), then are Sturgeon (black car) and J. Robinson (white car), then the pack of Beckman (red), White (white/blue), B. Robinson (white/blue) and Lim (black/blue). 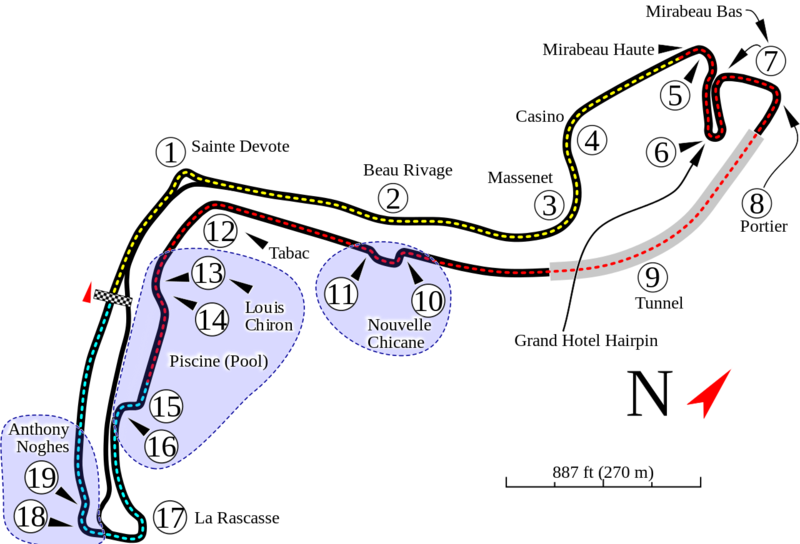 Through Tabac and the swimming pool series of corners, the pack pretty much stayed in the same order, except that White spun at Tabac. Richard White spins at Tabac. White’s spin at Tabac didn’t hurt him too much, as only B. Robinson got past him there, but then Beckman’s Ferrari was able to force a pass on both B. Robinson and White just after exiting Tabac. Lim tried to force a pass on White after Tabac, but White slammed the door on Lim. Then at Rascasse, Cook and Kaluzny, got through a wee bit before J. Robinson and Sturgeon, and Cook and Kaluzny pulled into the pits for fresh tires. Meanwhile, White spun again, this time at Rascasse. As the 1st lap is almost complete, White spins a 2nd time, this time at Rascasse, while Cook and Kaluzny pull off the track into the pits. 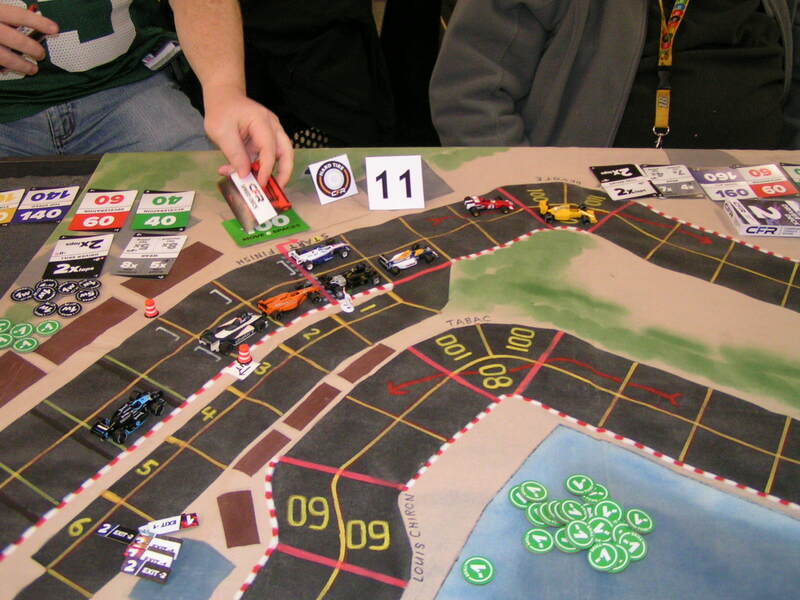 While Cook and Kaluzny were in the pits, the other six cars on the track all also pulled into the pits, making the first time in the CFR-Detroit racing series when all cars were in the pits at the same time. 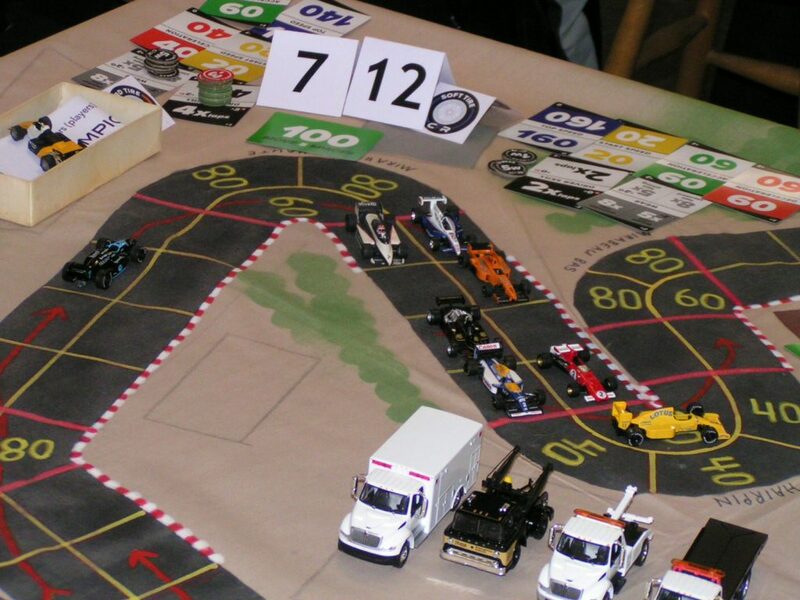 At the end of the 1st lap, all eight cars are in the pits at the same time. While in the pits at the end of the 1st lap, Cook, J. Robinson, Beckman, Lim, and White all switched from hard to soft tires, while Kaluzny, Sturgeon, and B. Robinson all changed from soft to hard tires. This meant that all drivers had fulfilled their obligation to drive on both different tire compounds during the race. After the pit stops, the official order after the 1st lap was Cook, Kaluzny, Sturgeon, J. Robinson, B. Robinson, Lim, Beckman, and White. Coming out of Ste. Devote on the 2nd lap, Beckman tried to force a pass on Lim, but was balked and had to slow by 40 mph. Beckman had just had to spend three wear chits in going through the Ste. Devote corner, and then spent 2 more wear to slow, meaning he used up 5 wear in failing that forced-pass manuever, of which he only came out of the pits with 12 wear, so he used 42% of his wear allotment on that one corner. That huge wear expenditure was to haunt the Ferrari driver for the balance of the race. Beckman was able to get by Lim and before they reached the Massenet corner, though. Garry Kaluzny (orange shirt and car) plots how to catch Cook’s yellow Lotus heading into the Mirabeau Haute corner. Jack Beckman looks on in his red Ferrari shirt. 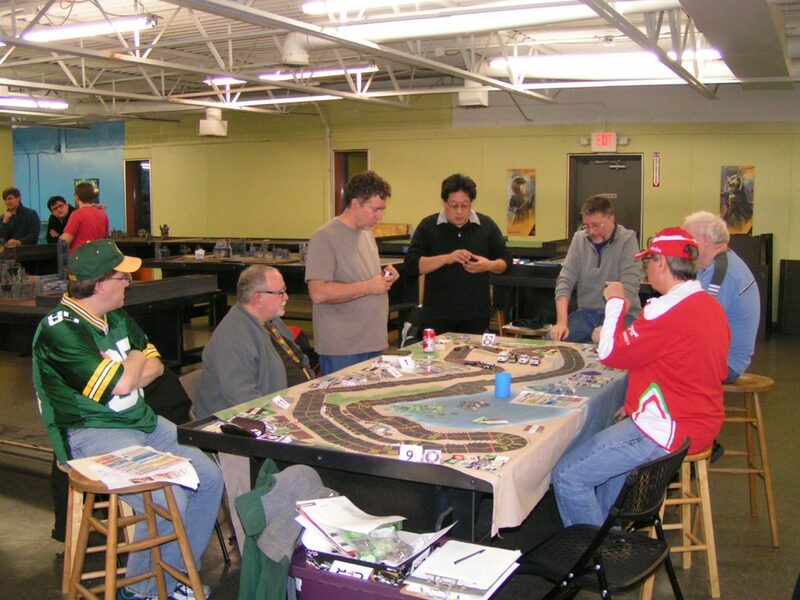 The drivers at the Monaco Grand Prix (clockwise, from left): Mike Cook, Jim Robinson, Richard White, Greg Lim, Gary Sturgeon, Brian Robinson, Jack Beckman. Farther back in the pack, Beckman passed an unmodified Chance roll through Portier to take 7th place from B. Robinson, but then when Beckman took another unmodified Chance roll at the Nouvelle Chicane, he spun, thus allowing B. Robinson to regain 7th place. Past the swimming pool corners the 2nd time, Cook stretched out his lead over Kaluzny to 5 spaces after Rascasse. Sturgeon, J. Robinson, and Lim were closing in on Kaluzny, and White, Beckman, and B. Robinson had fallen further behind. 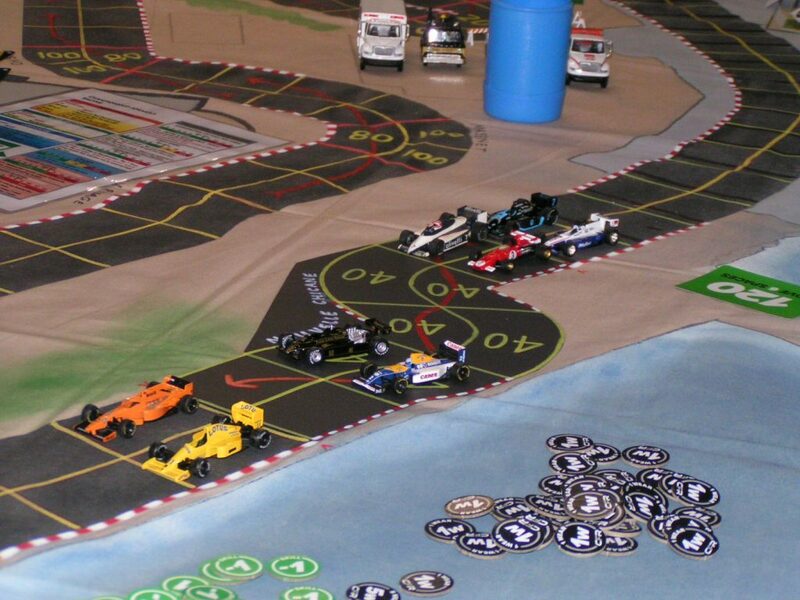 Through Rascasse on the 2nd lap, Cook’s yellow Lotus leads by an increasing margin. As the 2nd lap was nearly complete, most of the cars pitted again, all of the pittees switching back to or else installing a new set of soft tires. The sole exception was Brian Robinson, who opted to stay out on the track on his hard tires (thus regaining two wear). The official order after two complete laps was Cook, Kaluzny, Sturgeon, Lim (driving his best race so far), J. Robinson, B. Robinson, White, and Beckman. Early in the 3rd lap, Cook stretches his lead to 8 spaces over Kaluzny. Sturgeon is right behind Kaluzny’s tailpipe, then other cars are strung out behind. After the 2nd lap pit stops got sorted out, Cook was enjoying a comfortable lead, and looked to have an easy victory ahead of him. Kaluzny was trying to keep Sturgeon’s John Player Lotus behind him, and Lim and J. Robinson were battling for 4th place. Sturgeon finally got his Lotus past Kaluzny’s McLaren at Massenet, although Kaluzny stayed right with Sturgeon until they got around Portier, when Sturgeon’s superior top speed enabled him to motor away towards a sure 2nd place. Also, Lim had got by J. Robinson at Massenet, thus taking 4th place. 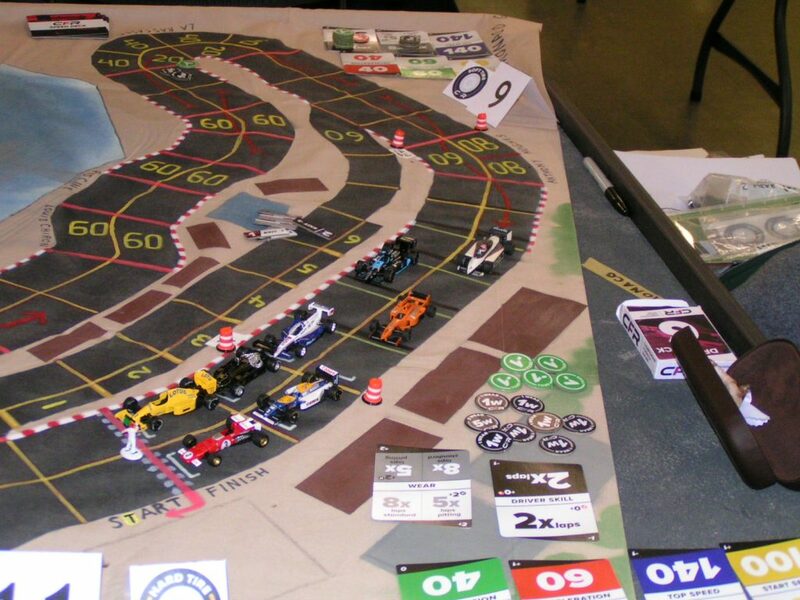 Cook leads through the chicane on the last lap as Sturgeon, Kaluzny, and Lim battle just before the chicane. Through the last few corners, Cook (0) won the race going away, enjoying an 11-space margin over 2nd-place Sturgeon (+1) at the finish line. Kaluzny (+3) managed to just nip Lim at the line for 3rd place, as Lim (+3) finished in the points, in 4th place, for the first time in his young driving career. 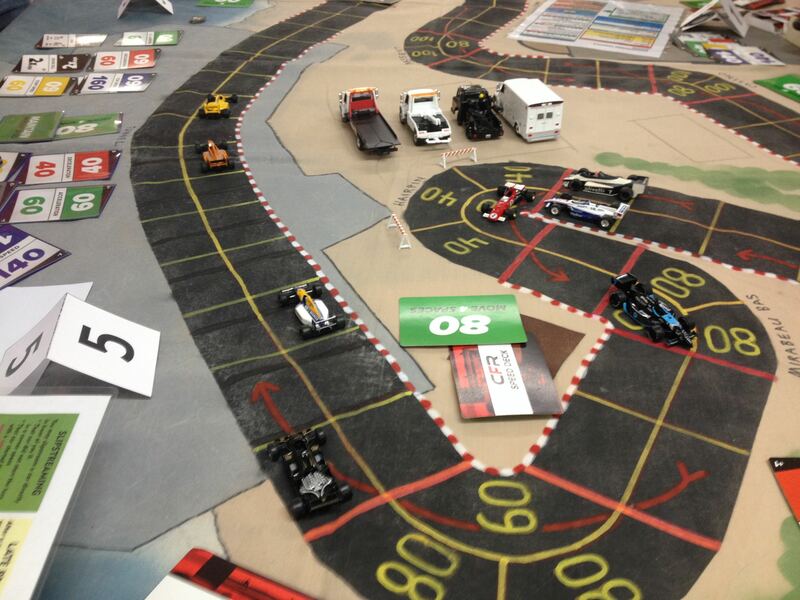 Then Richard White (+3) came in 5th, having passed J. Robinson at the Rascasse corner. J. Robinson (-2) got the final points-paying position in 6th place. B. Robinson (-2) crossed the line in 7th, but Beckman (-6) crashed at the Anthony Noghes corner, the last corner on the track. Beckman’s crash was the first time a car failed to complete a race in the CFR-Detroit 2017-2018 season. The + or – numbers indicate how many positions that driver gained (+) or lost (-) from where their car qualified for the race. 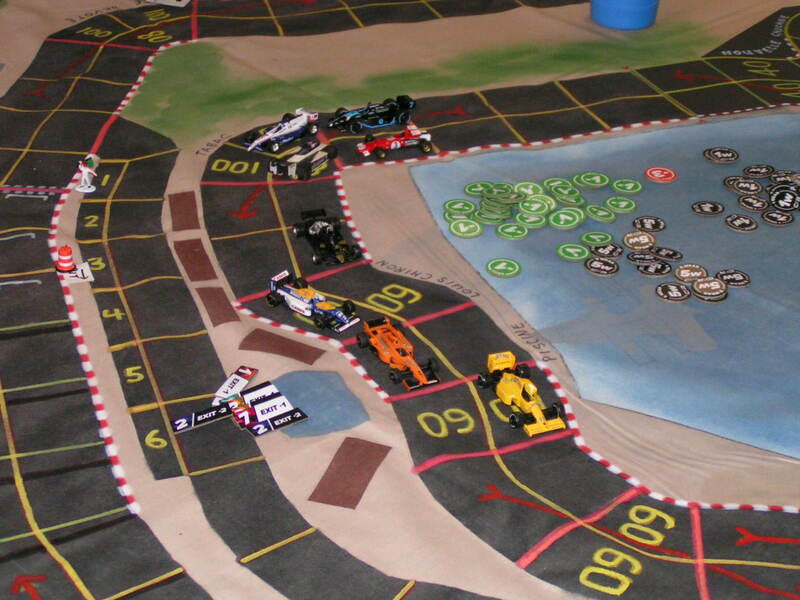 Cook’s yellow Lotus crosses the finish line in victory with a healthy margin over Sturgeon’s black Lotus. 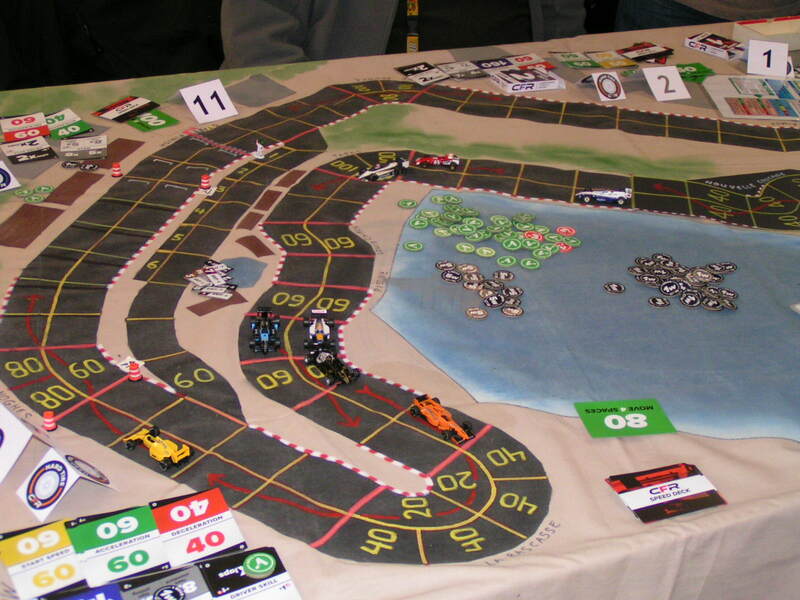 The points awarded at the Monaco Grand Prix: Cook 10; Sturgeon 6; Kaluzny 4; Lim 3; White 2, J. Robinson 1. 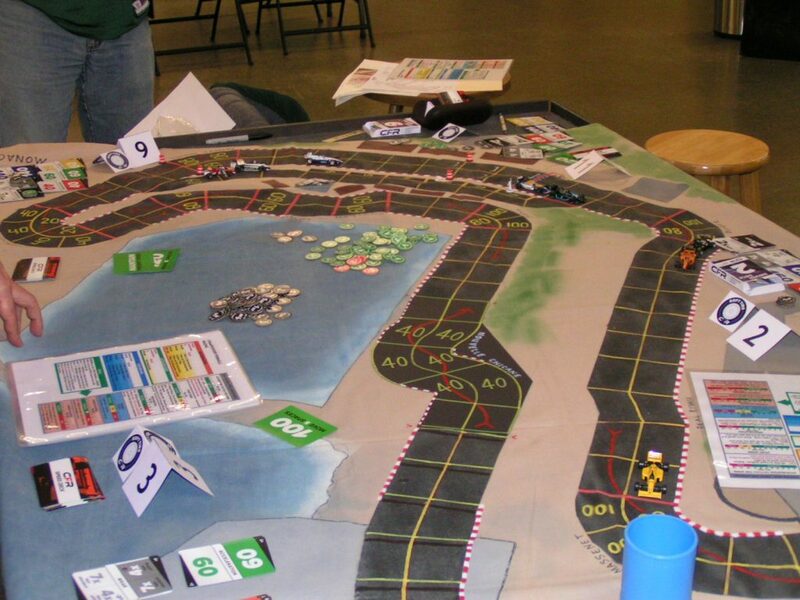 The next race, The Belgian Grand Prix (at the Spa-Francorchamps circuit) of the 2017-2018 CFR-Detroit racing season will be on Friday, December 8th, at Pandemonium Games & Hobbies at 6033 Middlebelt Road in Garden City, Michigan. Race time is 7:00 pm.